Ahh, Italy. A name that conjures up visions of rolling green hills covered in poppies, Roman ruins majestically fighting the ravage of time, and sipping an espresso at a sidewalk cafe in a cozy piazza. But on top of la dolce vita, Italy is a well-established hot spot of cycling of all kinds for all levels, and there is no place else like the Alps. Whether switchbacking up a mountain road, bombing down rocky singletrack, or casually pedaling along postcard-worthy alpine lakes, Bella Italia has it. Italians take cycling seriously. Locals are almost always friendly and happy to give directions, a big smile, and a little encouragement. Cycling routes are well-marked, the maps are excellent, and this being Europe, public transportation is cheap, convenient, and (of course) bike-friendly. Use it to skip climbs or to get home after trashing your legs. Cars are used to cyclists on the roads, and the hotels, restaurants, and cafes are happy to refill water bottles or offer refuge if a quick thunderstorm rolls through. Road racing is one of the big national sports in Italy. 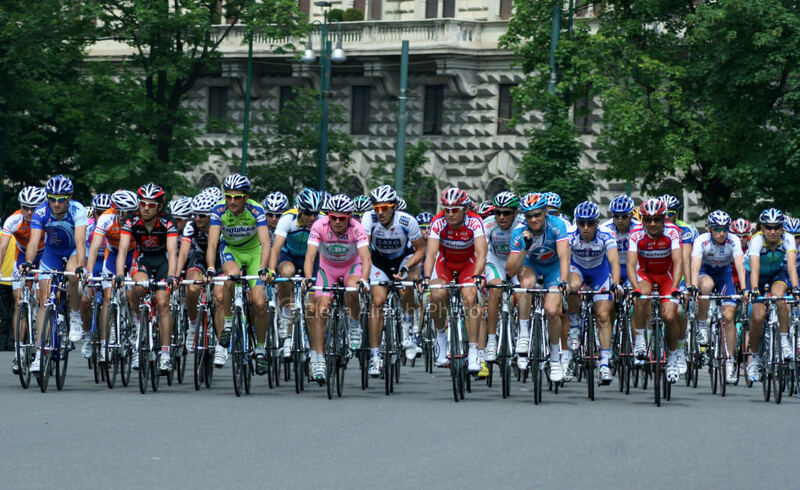 The Giro d’Italia is the second most important race in the professional world (the first is the Tour De France) and has produced some of the most colorful Italian heroes in cycling. Names like Coppi, Pantani, Cipollini, and Nibali are household names and rockstars in Italy. The Giro has also produced some famous climbs that strike fear into those who have to race up it, but make for an exciting cycling holiday for the average mortal. The crown jewel of road climbs in Italy has to be the Stelvio—the second highest pass in the Italian Alps. The classic route is from Prato, for a ride that involves climbing almost 6,000 feet and switchbacking up 48 (yes, 48) curves over 15 miles with an average grade of “only” eight percent. Although there are a few stretches that kick up to 10 percent, it’s not the grade that hurts, it’s the altitude—the summit is just over 9,000 feet above sea level. The literally breathtaking views from the top are worth the plane ticket (and the pain). If you’re looking for more of the same, but don’t know where to begin, consider staying in Bolzano. From here, you can access to six classic passes. 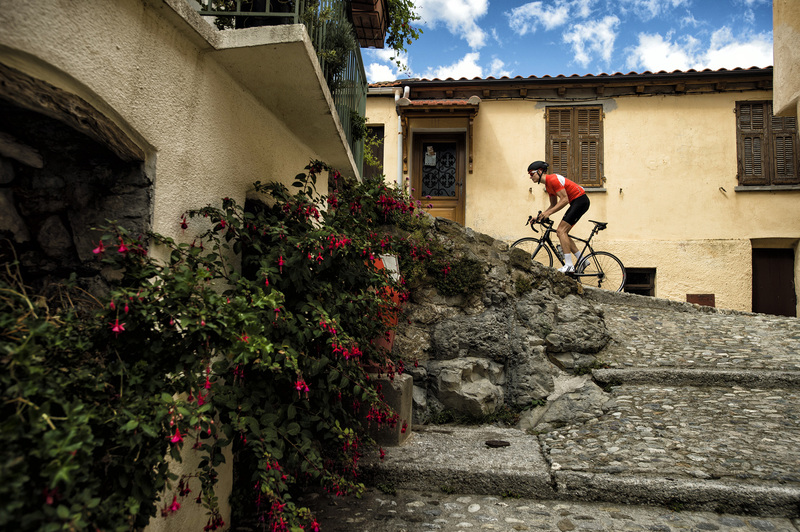 Another place to look into is Bormio—the perfect place to use as a hub for a full week’s riding. If the bike in your garage has fat tires instead of skinny, no problem—go to the Dolomites. The Dolomites are a UNESCO World Heritage Site, with a rich history and is home to a mix of cultures and languages, including French, Swiss, Italian, Austrian, and German. This variety is reflected in both the food and architecture of the towns, castles, and churches that dot the hillsides. 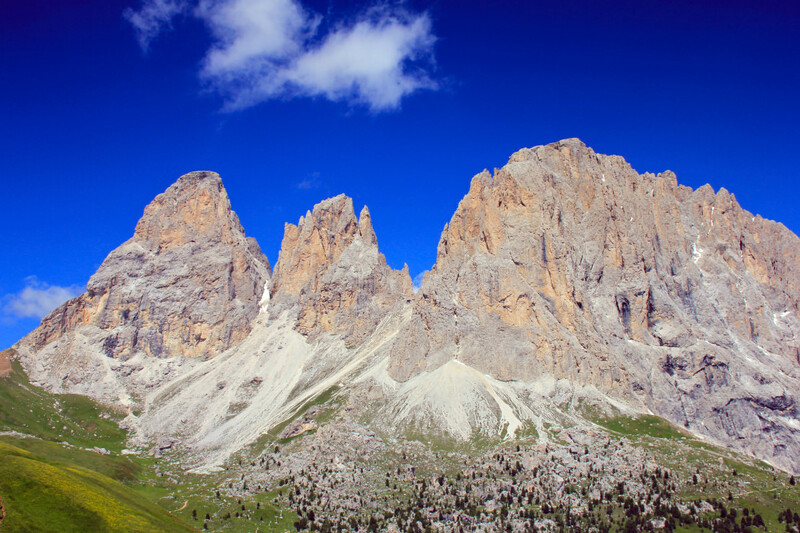 The Val Gardena area in the South Tyrol is a hotbed of mountain biking. This spot opens earlier (March) and closes later (November) than other areas in the Alps, and proudly boasts 315 days of sunshine a year. You’ll find more than 600 miles of trails and 30 specific mountain bike routes that connect the different villages and mountains. There’s something for everyone: from steep, techy action on exposed descents, to scenic cruises in high alpine meadows, to fast, flowy rides through ancient forests. One of the best ways to get a true taste of all the area has to offer is by doing the Sella Ronda in the town of Badia. 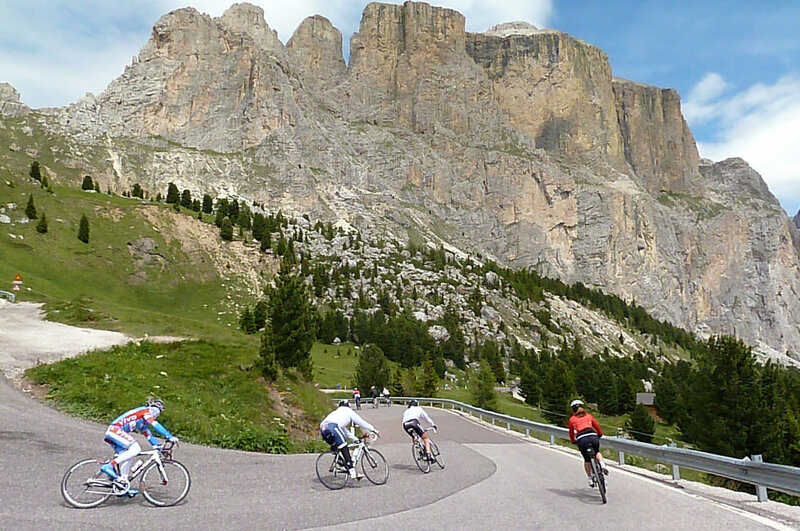 The Sella Ronda is a loop that hits four spectacular Dolomite passes: Gardena, Campolongo, Pordoi, and Sella. It’s a popular ski loop in the winter and can also be done via a slightly different route by bike. Take the loop clockwise for a 37-mile ride (including the distance covered by lifts), most of it on trail. Connect trail sections to the bottom of eight gondolas or ski lifts, catch a ride to the top, then rip down. 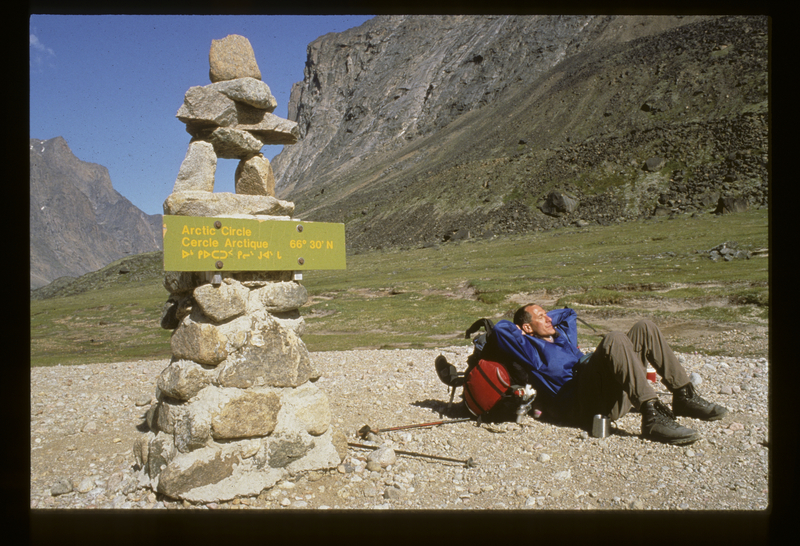 All told, you’ll descend about 14,000 feet and only have to climb about 2,400—not a bad ratio. The Italian Alps, like all mountains in the world, are known for quick-changing weather, so it’s important to be prepared for anything. Temperature swings of 40 degrees in 15 minutes are not unheard of, taking you from searing heat to shivering cold. Proper clothing choice not only means comfort and enjoyment, it can mean survival. Your body runs at its peak when at its perfect temperature: 37.5 degrees Celsius. The scientists over at 37.5 Technology have developed a fabric that actually controls the ‘microclimate’ around your body, keeping you comfortable. Embedded inside the fibers are activate particles derived from coconut shells and volcanic sand. These active particles attract moisture and then release it using your body’s own infrared energy, which provides cooling. If you’re not sweating, the particles hold on to that infrared energy to warm you. This wider range of comfort means you can perform at your best in a broad range of conditions and activity levels. Every mountain adventure should start with a baselayer. A good 37.5 baselayer will regulate your body’s relative humidity in all temps, allowing better athletic performance. Wear one on every ride underneath your jersey to keep a perfectly regulated microclimate next to your skin. Then look for jerseys and bibs with 37.5 technology as well. With all the changing terrain and conditions, staying dry is of the utmost importance. A super lightweight laminate jacket with 37.5 technology completes the kit. Anyone who has topped out a hot climb then got uncomfortably chilly when descending will appreciate how 37.5 technology responds to what your body needs. Italy is always a wonderful trip, and with the right gear, some planning, and some fitness, riding in the Alps is simply unforgettable. Andiamo!